President Park Geun-hye, marking one year in office on Feb. 25, has an approval rating of 56 percent in the latest opinion poll. Her job approval rating represents the second highest ever since 1988 compared to that of previous presidents’ marking their first anniversary in office. A survey of 1,200 male and female adults, conducted by Gallup Korea between Feb. 17 and Feb. 20, showed that the percentage of the respondents who approved or disapproved of the job President Park is doing was 56 percent and 34 percent, respectively. Gallup Korea’s opinion poll conducted on Feb. 16 showed that 58 percent of the respondents said she did a good job. Former president Kim Dae-jung got a 60 percent job approval rating, the highest since 1988 when Gallop Korea began to track the incumbent president’s job approval rating. President Park had the second highest rating among Korean presidents at 56 percent, followed by Kim Young-sam’s 55 percent, Roh Tae-woo’s 45 percent, Lee Myung-bak’s 34 percent, and Roh Moo-hyun’s 25 percent. President Park Geun-hye’s latest approval rating is a little higher than her election day vote rate of 51.4 percent during the 2012 presidential election and her job approval rating of 54.8 percent in an opinion poll conducted shortly after her inauguration. According to the latest survey, 15 percent of the respondents who approved of her job performance cited President Park’s acting according to her convictions and sticking to her principles, 14 percent approved her North Korean and security policies, and 11 percent cited her handling of diplomatic and international relations. On the other hand, 22 percent of those who disapproved of her job performance cited insufficient implementation of her campaign pledges or flip-flops, 16 percent disapproved of her insufficient communication, and 7 percent cited her clumsy handing of state affairs. (from left) President Park holds summit talks with U.S. President Barrack Obama at the White House on May 7, 2013,; President Park shakes hands with Chinese President Xi Jinping during her state visit to China on June 27, 2013,; and President Park holds bilateral talks with German Chancellor Angela Merkel on the sidelines of the G20 Summit in St. Petersburg, Russia, on Sept. 6. President Park’s approval rating had ups and downs according to unexpected variables and accidents. Her approval rating plunged below the 60 percent barrier in the wake of her government’s retracting some of her public campaign pledges and the derailment of tripartite ruling-opposition party meetings, and the approval rating further dropped to 48 percent in the third week of December 2013 due to the military cyberspace command’s alleged involvement in the 2012 presidential election and railway workers’ strike. She saw her approval figure this past early January return to the levels shown shortly after her inauguration due to the settlement of the railway strike, her New Year’s news conference, her visit to India and Switzerland, and a special pardon on the lunar New Year day. A survey of 1,000 men and women aged 19 or over across the nation, conducted by the survey company Matrix in cooperation with the Maeil Economic Daily-MBN, also indicated that 65.2 percent of the respondents approved of the job President Park is doing as president. Regarding the most laudable areas, 29.4 percent picked her diplomatic policies, 19.7 percent cited North Korean policies, 14.6 percent saw eye to eye with her on welfare policies, 4.4 percent commented on her economic policies, 3.5 percent mentioned her cultural polices, and 3.3 percent spoke of her educational policies. 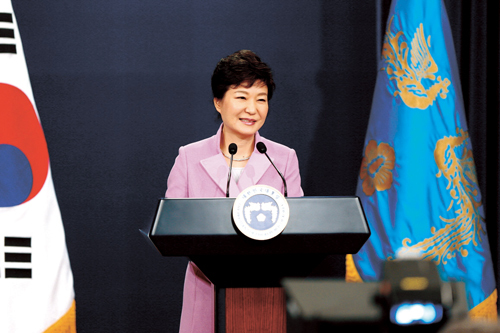 Heading into her second year in office, President Park is setting in motion the “GREAT Korea” vision for a quantum jump, as she commented while presiding over a meeting of economy-related ministers at the Sejong Government Complex on Dec. 28, 2013. The vision “GREAT Korea” is an acronym of the words Growth, Reunification, Eurasia Initiative, Abnormalities normalization, and Trust. As President Park was holding her New Year’s news conference at the Cheong Wa Dae on Jan. 6, she announced the establishment of a three-year plan for economic innovation to flesh out the vision during this year. “I will work to make sure that the Republic of Korea has a successful year and makes an economic takeoff. I will ensure that the nation and the people will gain new vitality and move ahead,” she said. President Park’s second year in office is geared toward two goals: growth and a solid foundation. The government focused on pumping water to turn around the economy last year. The three-year economic innovation plan starting this year calls for regulatory reform to boost investments and give a shot in the arm to service industries. She said, “This year, I will formulate a three-year plan for economic innovation and yet another growth surge with benefits that the people will be able to feel. With the success of the plan, I will help open an era of happiness for the people.” Park said that if her plans are carried out successfully, the potential growth of the Korean economy will jump by four percent and per capita income will exceed $30,000 three years later. (from left) President Park poses with British Queen Elizabeth II in Buckingham Palace , while making a state visit to the United Kingdom, on Nov. 5, 2013,; President Park talks with Russian President Vladimir Putin on the sidelines of the G20 Summit in St. Petersburg, Russia, on Sept. 6, 2013; and President Park Geun-hye speaks at a meeting of the heads of 30 foreign companies doing business in Korea at Cheong Wa Dae, on Jan. 9. “I will help make a dynamic, innovative economy through a creative economy,” she said. Last year, government-wide plans to realize the creative economy were drawn up. In an effort to ensure that the economy is turned into a creative economy, the government took steps to bolster an ecosystem for starting venture businesses and opened the website “Creative Korea” to encourage creative ideas. At the news conference, President Park stressed preparations for Reunification. Park said many people think reunification will cost too much, but she replied that in a word, it is a bonanza. “I think the reunification of the Korean Peninsula will serve as an opportunity for our economy to make strides forward,” she said. “For the Republic of Korea to reach still greater heights, it must move beyond the division of South and North and the threats of war and nuclear weapons to usher in a time of unification on the Korean Peninsula. And preparations for such a time must begin now.” The president said her government will make joint efforts with neighboring countries to prevent the advancement of the North’s nuclear capabilities and to devise various steps for its complete dismantling. “If the North takes genuine steps toward denuclearization, both South and North as well as the international community will be able to take meaningful action together, not only for real peace on the Korean Peninsula, but also for shared prosperity in Northeast Asia,” she said. The Park Geun-hye government’s Eurasia Initiative could be a catalyst to reshape the landscape of the Korean Peninsula in connection with inter-Korean ties. The initiative, proposed by President Park last year, is an economic and diplomatic approach to ensure economic revival and establish a solid foundation for a peaceful reunification. The Rajin, North Korea-Hassan, Russian project, part of the initiative, aims at modernizing a 54-km-long railway connecting two points of North Korea and Russia to expand South Korea’s trade with the vast Eurasian market. “In the days to come, if we could build a peace park in the DMZ and tear down the walls of distrust and contention, and if we could connect a Eurasian railway and so transform the Korean Peninsula into a channel of trust and peace, we would be that much closer to making unification a reality,” the president said. President Park sticks to ‘trust politik.’ She crusades for the trust-building process toward North Korea. Park’s trust politik began to pay off in the latest meeting of ranking government officials, which led to reunions of families separated between South and North Korea, even though the possibility that the warming ties could evolve into a full-fledge inter-Korean thaw remains to be seen.